Okay, so some people just HATE tofu. T, who grew up with it from childhood, LOATHED it until at some point in her twenties when… she got over it. It’s … just like any other ingredient, in that it’s a Thing to which you add Other Things and then it has flavor. Of course, meat allegedly has its own flavors even without additions, but that’s the blood, and we’re ignoring that. Meat (sans sangre) is flavorless, just as tofu is flavorless. 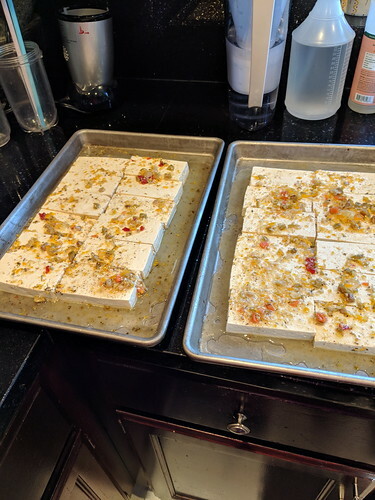 As an ingredient, tofu is fine, and, even better, is lacking weird stringy bits and wobbly things you don’t want to identify. It’s a perfectly reasonable food, you just have to season it. This recipe is adapted from Doesn’t Taste Like Chicken‘s. We realized that, like most people, we’d fallen into a meal rut, with winter casseroles and heavy, savory things like beans. Our attempt at something piquant and unique was this dish, which is both crunchy and tangy. It turned out surprisingly well, it was (mostly) easy and quick to prepare, and a good use of odds and ends for side dishes and whatnot. And, if you love someone vegan or vegetarian? It’s well worth preparing during this ridiculous Hallmark holiday… celebrating the tang of lemon as an antidote to the saccharine of the holiday. *cough* Or something. We’d forgotten how much of a chore the multi-step dredging food in flour and panko can be… since we’d not made anything which required these steps in about a year and a half, the last time we made faux crab cakes (squeeze-dried shredded zucchini, panko, Old Bay – tasty). 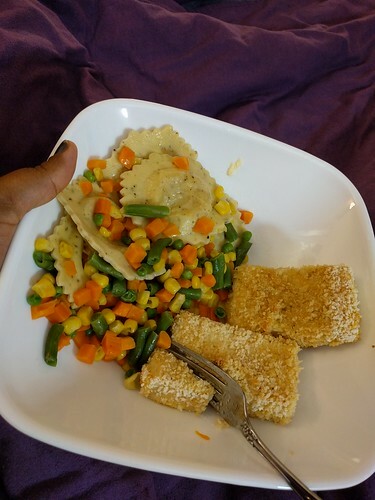 Fortunately, after all the plate-of-flour-and-seasonings, plate-of-wet-binding, messy-sticky-hands thing, we discovered that this tofu dish works nicely baked – and there’s less a chance that your chef will get bored and forget she has something on the stove. Ahem. 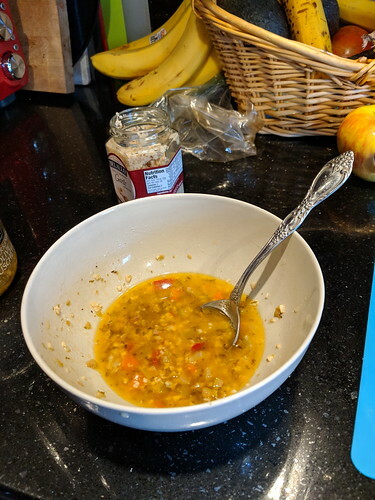 It’s easy to leave dish as vegan, as is, or, if you’re feeling particularly beleaguered that you’re ACTUALLY EATING TOFU and it’s NOT EVEN IN AN ASIAN DISH, you can use an egg whipped with water to make the recipe safely animal-product-y. The flour dredging is a place to layer in the flavors, to give your tofu the taste you prefer. We entirely forgot the nutritional yeast in the breading, but added pretty much everything else, including random herbs not called for, old packets of Parmesan from pizzerias, a sprinkle of Old Bay, even more garlic (because since when is three cloves enough???? 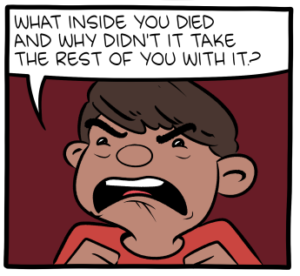 ), and ground cayenne (because: we add it to EVERYTHING). Each time we ran short of the dredging blend, we remade it differently, and T didn’t follow any measurements at all. (It’s a wonder anything she makes ever turns out.) We did a test run of this dish after making something else, just in case, but it’s good enough to serve as a main dish with a couple of sides. The lemon shines through, and the exterior crunch is a nice contrast to the soft tofu insides. (It’s not as soft as it would have been, as firm tofu gets even MORE firm when you’ve a.) frozen it and b.) pressed out all of the water. If you dislike tofu for texture reasons, you might try that.) The recipe inventor finishes this with parsley and sliced lemons, but tonight, we’re going to make a buttery lemon sauce, which will really bring out that lovely tang. Pair this with steamed veg like green beans or asparagus, a lemon-infused rice, or lemon pasta, or savory roasted sprouts. This was a surprisingly delicious meal, and perfect for the suddenly chilly evening. Here’s to home cooking, and the attractive nuisance that is a bored person in a kitchen. LOVE panko and anything with lemon/garlic is a good idea. Will definitely try this when my kitchen gets unpacked. My favorite kind of cooking: a bit of this and that, different, but tasty each time. I’ve never thought of freezing lemons, but then, I don’t have a tree producing like crazy, either. 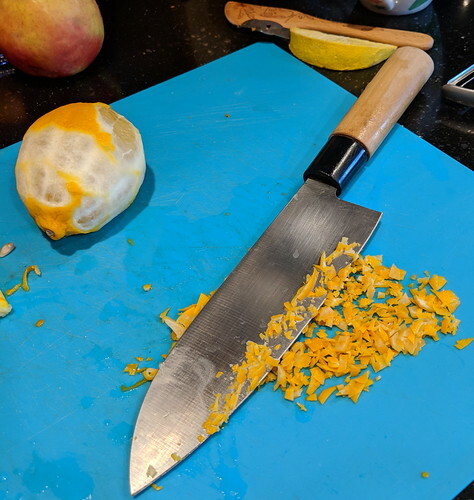 I’ve learned the zest before you do anything else lesson at other points because I think we’d all agree that trying to zest an already juiced lemon half is not fun. Sounds like a good recipe from this person who is not all together sure where the tofu at the market is shelved. @kellypea: There are six citrus trees in this yard… SO much freezing will be done, but definitely: zesting first. Because that was frankly embarrassing.